So, what’s the best scope for 6.5 Grendel? The 6.5 Grendel cartridge is a high-accuracy, reliable, and powerful bullet. It was designed to increase the range of an AR-15 to over 1,000 yards at supersonic speeds and also designed for hunters going after deer sized animals between 300-400 yards. As your excitement level is peaking and you reach into your gun cabinet for your buddy ol’ pal of a rifle you suddenly remember you don’t have a scope for your friend. How will either of you even see out 1,000 yards? Or even 400? You’ve been so busy shooting up pop cans and milk jugs you never thought this 6.5mm Grendel was going to come around. But don’t worry, that’s where we come in. 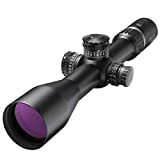 We’ll go over the best scopes that work well with the 6.5 Grendel for you and your rifle to be landing those shots in no time and also for you hunters that are hunting deer-sized game at 300 to 400 yards. Before you run off and drop the bank onto a fancy new scope it’s important to know what you’re shooting intentions are. With the 6.5 Grendel, you could be using your rifle for a couple things. You are either going for the long-range 1,000-yard recreational shot or you might be trying to hunt animals that are around deer size for 300 to 400 yards. Make sure you know what you’re looking for in your shooting experience and you’ll soon know what you’re looking for in a scope. This will save you the heartache of buying something you don’t need. We like to get it right the first time, you know? Since the 6.5 Grendel can be used for the thousand-yard shots you would definitely want to consider variable magnification. The magnification power is really the primary thing you’re looking for, so if you can sacrifice other features…do that. But get the magnification power if you’re going for long-range. Since you can shoot that far now, you’re going to need to see that far. Also, if it turns out to be too much magnification you can always dial it back. As far as hunting is concerned with variable magnification it’s important to be prepared for the close-range shot if you need to be. The 6.5 Grendel was designed for the AR-15 structure in mind so it can join the long-range shooting game that has become popular with recreational shooters. So, if you are just going to be shooting 1,000-yard targets you can keep it on maximum magnification all day. But, if you do want to be prepared for a close to mid-range shot without losing your field of vision it would be best to stick with scopes in the 4x-16x or 3x-15x. This gives you a good depth of view at low range magnification so you can have a wider range of vision to see the hunting scene. Versatility is key if you want to do both. The reticle comes into play here and if you’re going for long-range with the Grendel we might recommend a BDC or mil-dot reticle. These reticles have bullet drop compensation (BDC) and the mil-dot has bullet drop and also wind resistance hash marks so you can adjust accordingly for any shooting situation. You can even get illuminated reticles with the BDC or mil-dot. This will illuminate your reticle, not the target. It’s helpful in a low light environment so you can still see the reticle. Ultimately, the BDC or mil-dot will help you in any hunting conditions but you should consider the fine duplex for hunting. Why? Well if you’re hunting with the 6.5 Grendel at a mid-range you don’t necessarily need the hash marks for compensation if you’re doing short to mid range hunting at 300-400 yards and a fine duplex reticle will ensure that you can you see your target clearly without blocking too much light. Basically, the reticle becomes less busy. The last thing we’d consider when looking for a scope for the 6.5 Grendel mag is which focal plane you want to use, first or second. If you’re not familiar with the difference it’s basically that the reticle dots will change in size with the first focal plane (FFP) based on the magnification while the second focal plane (SFP) does not. What does this mean? It means the second focal plane’s hash marks to adjust for bullet drop and wind resistance only work at one specified magnification, usually the highest magnification setting. In regards to the 6.5 Grendel if you are just going to be rocking the high magnification for long-range target shooting then the SFP scopes will work fine for you. However, some hunters are getting involved with the FFP because they are wanting to do long-range hunting as well as short range and the FFP will be the ideal version for you if you fall into that category. If you’re a competitive shooter I wouldn’t deem FFP necessary, but it’s a good backup to your rangefinder. Basically, the compensation hash marks on FFP will work on any magnification and gives you that much more versatility for hunting or target practice with your rifle’s 6.5 Grendel cartridge. The weight of your overall build is highly controversial and largely based on opinion, in general. With the 6.5 Grendel build you won’t need to worry so much about the tactical functions of close quarter combat against wild animals if you’re just doing long-range target practice with it. However, if you are going to be hunting and know you might be finding yourself in close quarters with a wild animal you might be considering a lightweight build. We will have the weights listed for the scopes so you can keep those considerations in mind depending on what you’re looking for in your Grendel build. Also, a lighter build is easier for hiking around in the backwoods and up the mountains. Just sayin’. 4-16X MAGNIFICATION: The second focal plane design keeps the reticle the same size at all magnifications from low power to advanced reticle functionality at 16x max power. MIL-DOT RETICLE: The illuminated mil-dot reticle offers the ability of switching between short and long range viewing. ILLUMINATION: The partial red illumination is powered by the included CR2032 battery and has a total of 12 brightness settings. LOCKING TURRETS: The turrets lock when pushed all the way in. Pull up or out to adjust elevation and windage. The Primary Arms scope is awesome for the Grendel setup if you’re on a budget and looking for the switch between the hunting short to mid-range shots as well as long-range. The 4x-16x magnification will give you the wide range view on low magnification so you can acquire your target easily, while the intense magnification of 16x will let you land those long-range shots with ease. This design does utilize the SFP design so it’s going to render the mil-dot reticle that it comes with useful only if you are using it at its maximum magnification. It’s also quite bulky coming in at 1.63 pounds so it’s not going to provide any tactical bonuses in short range, split-second decision scenarios. Some customers have stated that the glass is not as clear as they would have liked it to be and also have had issues with debris and dirt getting stuck in the glass. It’s a good scope for the budget, but it may not be the quality you are looking for so keep that in mind. Most customers that give it a good review on the optics say that the glass is good…for the price. It does come with the illuminated reticle which will help you out in low light situations and is waterproof, fog proof, and shock resistant. The Burris Fullfield II Ballistic Plex Riflescope comes in at a medium weight of 1.12 lbs. The Ballistic Plex reticle functions similar to a BDC reticle where it has the hash marks to compensate for the bullet drop. It is an SFP design, so again you need to know if this is what you’re looking for with your Grendel setup. The SFP will keep the reticle the same size so it’ll work great for short to mid-range shots and is awesome for hunting, you just can’t trust the hash marks to give you proper bullet drop compensation based on your zero except when you’re on your maximum magnification. If you want to use this as a mix for both hunting and long distance shots, a rangefinder would be a good partner to it. The magnification adjusts by turning the entire eyepiece of the scope and gives you an adjustable eye relief between 3.1 and 3.8 inches. Customers state that the scope is bright and clear at a level that’s great for the cost. The variable magnification is a range from 4.5x-14x so it will hold enough power for any long-range shooting you want to do if you’re stretching your legs on the 1000 yard ranges. The turret adjustments are steel on steel which is sturdier than the plastic that you find on some scopes. This one actually comes with a no-fault lifetime warranty as well with less strict regulations as opposed to some other companies that offer the lifetime warranty on their product. The Leupold VX-2 comes in as one of the lightest scopes on the market, weighing in at 13.1 oz. Think they skimp on the quality to get this? Guess again. This scope rocks all the standard O-ring design to keep it waterproof, fog proof and shock resistant. It has parallax adjustment knobs that are well designed and well put together. You don’t have to worry about the scope falling apart like some lower quality designs. The adjustment knobs adjust at ¼ MoA per click and are easily accessible as the standard knobs on the top and side of the scope. The duplex reticle comes pre-installed in this scope that gives you a full range of vision without having the reticle be busy. The result? You can see your target clearly. While the hash marks are good for the long-range, if you’re setting up your Grendel for mid-range hunting this scope has it all. The power selector on the side of the scope lets you zoom in and out with the variable zoom to quickly alternate between the bigger picture to get the full range of vision and the finer details of a long distance shot. Also, customer’s state this scope is high quality and gives you a better picture than the naked eye and lets you see a little later into the evening than lesser quality scopes. Customers are saying that it can shoot well up to and over 300 yards but you’ll want a longer range scope once you can hit the 300-yard mark consistently. Something to keep in mind if you’re jumping to the 6.5 Grendel for that 1000-yard game. Illuminated reticle reduces time to get on target in any lighting condition and dramatically increases accuracy when target is dark. The Burris XTR II comes in with the variable magnification of 3x-15x which is right in that sweet spot for your Grendel setup. It’s going to be powerful enough to stretch your legs to those 1,000-yard shots and give you the versatility to play in the 300-600 yard range. You also have the whole range of zoom to play with when considering different situations if you really want to use it hunting. It’s a beastly scope, though, which comes along with the weight of 1.93 pounds. Keep this in mind if you’re going for a backwoods lightweight build to hunt with. It’s really more of a long distance, competitive shooting scope where you’re not expected to be bouncing around too much. It’s specifically designed for long-range tactical and competitive shooters so it would be a great combination on your rifle with the Grendel if you’re taking it to that next level. It runs on the first focal plane so the mil-dot reticle will adjust with the amount you zoom in. This means the hash marks to compensate for bullet drop and windage will follow right along with your zoom. It has knobs to adjust zoom and the turrets to adjust for the elevation and windage off of your zero which really helps out with those long shots. On top of that? Well, it has the illuminated reticle so you can still see the reticle even if the light of your environment isn’t the best. O-ring sealed and argon purged, the Viper delivers waterproof and fog proof performance while the single-piece, aircraft-grade aluminum construction gives shooters a durable platform. This Vortex Viper PST Gen II comes in with the sweet 3x-15x magnification as well, giving you that close range and long-range capability with the different zoom options. It’s rocking the FFP design so your reticle follows along with the zoom. Some experienced competitive shooters claim this unnecessary but it’s a solid backup if your rangefinder dies in the field. If you need to dial your turrets for bullet drop and wind compensation you’ll be pleased to find that customers are reporting dead-on accuracy with the adjustments. Can’t really ask for better than that. Unique to the Vortex Viper is the zero stop. Once you zero your scope you can lock this in so you can’t overpass your zero on accident and the turrets have resolution indicators to keep you from getting lost on your knobs. It comes with the illuminated reticle for when the sun’s going down and you’re still shooting. It’s also standard with waterproof, fog proof, and shockproof O-ring technology. Look, this scope is seriously awesome for you if you’re looking for those long-range, competitive shots. If you’re looking for mid-range game hunting to engage white-tail deer you really don’t need this for your Grendel setup even though it fits the variable zoom range. You are just going to be paying for a bunch of extra features that you don’t need and can really save the money. Remember! Know what you’re shooting and the scope will find you. Now you got all the details on the scopes in the marketplace to do that are going to get you the best scope for the 6.5 Grendel. Each of these scopes come in with different features that are directed towards different types of uses. So regardless if your long-range specific, short/mid range or both you can now find the scope that works best for you. Happy shooting and keep killin’ it!